Zhang’s latest, “Curse of the Golden Flower” (opening in Japan as “Ouhi no Monsho”) sees him in the latter mode, albeit with diminishing returns. Zhang started on this road after witnessing the success of Ang Lee’s “Crouching Tiger, Hidden Dragon.” His first wuxia (martial arts) film “Hero,” coming after a career’s worth of serious dramas, pulsed with the sheer exuberance of playing with a new form. The lavish set design and over-the-top action sequences (of flying through the air and batting away flurries of arrows) got even better in “House of Flying Daggers,” though that film descended into some pretty histrionic performances by the closing reel. 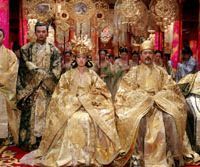 “Curse” seems to have picked up from that point and turned the emotions up to “11.” The film starts as a tense tale of palace intrigue in the Tang dynasty, but soon ascends to a level of hyperventilating hysteria that quickly becomes wearying. The good thing about the film is that Zhang is again working with his former flame and muse, Gong Li, who split with the director — personally and professionally — after 1995’s “Shanghai Triad.” Gong is an exceptional actress, but she sure hasn’t been asked to do much in films such as “Miami Vice” or “Memoirs of a Geisha”. Here she plays Empress Phoenix — the daughter of the King of Liang, she was married off to an ambitious army officer who is now emperor (Chow-Yun Fat). They have three sons. There’s the foppish Prince Wan (Ye Liu), next in the line for the throne and the offspring of the emperor’s former lover. He harbors an attraction for his stepmother, and the feeling seems mutual. Then there’s the middle son, Prince Jay (Jay Chou), who has just returned from fighting Mongols on the border for three years and seems a much more stolid type. The youngest son, Prince Yu (Qin Junjie), is rather immature, resenting the attention his elder brothers get. The plot gets even thicker: Prince Jay is enamored of a servant girl, which raises his parents’ ire. Meanwhile, the emperor has been slipping poison in his wife’s medicine, and a mysterious, black-clad figure from the emperor’s past appears, triggering apocalyptic events. A king with three sons and plots against him will no doubt evoke memories of Akira Kurosawa’s “Ran” (itself a remix of Shakespeare’s “King Lear”), but there was something genuine about the spectacle of that movie, real columns of troops storming real castle walls, as opposed to the fuzzy, shimmering computer-generated legions in “Curse.” Part of the film was shot in Beijing’s Forbidden City, but the on-screen resolution is so poor that it sure looks virtual. Zhang and production designer Huo Tingxiao have been going with bold, all-encompassing color motifs in these epic films, and this one is gold, the Tang equivalent of Oz’s Emerald city, where everything glitters and shines, right down to the gold powder-gloss Gong smears on her lower lip. The palace interior, where not golden, is a psychedelic riot of floral colors. 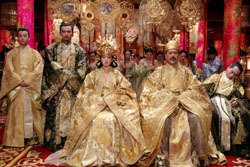 The costume design by Yee Chung Man is equally imaginative, and the bosom-boosting bodice he squeezes Gong Li into is beyond description. Gong is never better than when she’s playing an ice queen, and her barely contained fury here is something to watch. The rest of the cast are merely OK, and the completely over-egged last act teeters on the ridiculous as all involved perform with the subtlety of a rugby scrum. The multiple suicides and murders mean it will all end in tears, and when one stops to think about it, didn’t everyone die by the end of “Hero” and “Flying Daggers” too? Zhang’s fatalistic streak has haunted his films since “Red Sorghum” back in 1987, but it’s strange how completely he rejects the notion of fun in this fantasy genre. Zhang has denied making any political comment in this film, but he would, wouldn’t he, given that the Chinese government can ban filmmakers from working. But in the film’s many, many shots of hordes of faceless minions — maids, soldiers, cooks, cleaners — toiling for a corrupt, decadent, despotic ruling class . . . well, perhaps the allegory was so obvious it became invisible. One scene in particular sees a rebellious army massacred in a Tiananmen Square-like palace courtyard, followed by a legion of servants who wash away the rivers of blood and cover all traces of the carnage with a carpet of yellow chrysanthemums. Fantasy? Perhaps we should ask some Tibetans.